Taking care of your car is a lot like taking care of your body. You have to make sure you are putting the right things in as fuel. You need to take it in for a check up every so often. And you need to remove the gross toxins that are making you feel sick. The last part is very important, because grease, grime, and gunk can all build up in your car, especially on your engine, and cause serious performance and durability issues. A good engine degreaser helps get rid of all those other issues and returns your engine back to peak performance. While it might seem difficult to figure out which degreasers are better than others, this helpful guide will assist you in determining which engine degreaser will work best for you. What Is The Best Engine Degreaser Brand? An engine covered in grease and filth cannot achieve the same kind of power and efficiency that they should and otherwise would be able to if they were clean and uninhibited. That is why you need to invest in some good engine degreaser if you want your car to work well and your vehicle to last a long time. If you do not take care of your engine by cleaning it of grease and other gunk, you will end up significantly shortening the life of your vehicle, costing you a whole lot more money in the long run. However, it can be intimidating to survey all the options and try to decipher which engine degreaser actually meets your requirements and accomplishes what you need it to do. The most important thing an engine degreaser can be is effective. This may seem obvious, but a lot of degreaser options out there brag about doing and being a lot of great things without being of much use at the thing you bought it for – actually cleaning your engine. Grease and grime buildup is hard to clean (otherwise there would not be so many different products claiming to clean it up well) and if not addressed can seriously damage your car. So a good engine degreaser has to actually remove grease from your engine to be worth anything. Some formulas are more concentrated and you can make a little go a long way with them, while others are weaker and need a generous helping and some elbow grease to really make a difference. The more effective solutions may be more expensive, but wasting money on a cheap degreaser that does not work is worse than spending the little bit extra on a top tier product that actually cleans and restores your engine like it advertises. An engine degreaser also needs to be able to reach the trouble areas on the engine. The formula might work great and slice through grease like a hot knife through butter, but if there is no way to get the formula to reach the greasy spots, then it really is not doing you much good. Therefore, make sure your degreaser not only works well, but has an easy and understandable application method so you can really clean up that engine. Gunk EB1CA 'Original Engine Brite' Engine Degreaser - 15 oz. 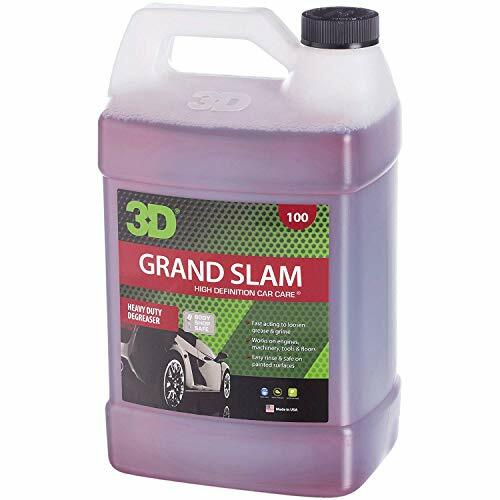 The 3D Grand Slame Engine Degreaser may be a more expensive option when compared to some of the other engine degreaser choices on this list, but its complete performance and effectiveness make it well worth the more costly price tag. This solution is extremely concentrated, so you can dilute it with water and it will still cut through most grease build up like it’s nothing. This way, a little bit can go a long way and you can save money and waste less material. The 3D Grand Slam goes to work immediately after it is applied, making quick work of even the most egregious grime buildup. And after it quickly disposes of any grease or filth, a simple rinse removes any and all trace of mess or cleaning agent. On top of all this, this engine degreaser is safe on painted surfaces, so you do not have to worry about ruining your ride’s paint job while cleaning and improving the inside. The GUNK EB1CA ‘Original Engine Brite’ Engine Degreaser is an inexpensive option ideal for those who need their engine cleaned but also do not have a big budget for an engine degreaser. This solution works quickly to remove grease effectively, so you can get your engine clean and ready to go without too much downtime waiting for it to work. The GUNK EB1CA ‘Original Engine Bright’ is a great option for the wallet conscious because the bottles are inexpensive. However, those cheap bottles sometimes come back to bite you, as they can get clogged easily, wasting lots of leftover solution. Also, it does not work as well against larger grease buildup, so if your engine is seriously gunked up you might want to look into a different option. But if your engine just needs a quick clean at a low price, the GUNK is a good engine degreaser for you. 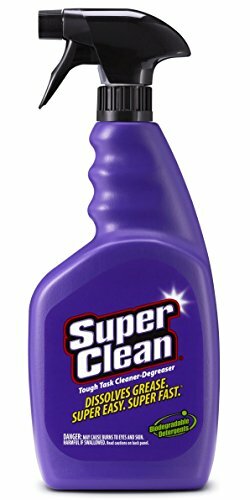 The SuperClean Tough Task Cleaner Degreaser is another inexpensive choice that still can get the job done. This cheap formula is biodegradable and phosphate free, making it a safer choice for the environment and your bank account. This concentrated formula helps make the degreaser more effective, and you can still dilute it with water to stretch out the life of the solution and get even more bang for your buck. While the SuperClean is effective at eliminating grease and dirt buildup, it may require multiple applications to take down the bigger grime deposits. This makes it hard to extend its lifespan by diluting it, since you usually end up using just as much if you had not added water to the solution. But if you are looking for an affordable and eco-friendly engine degreaser, this is an excellent option for you. 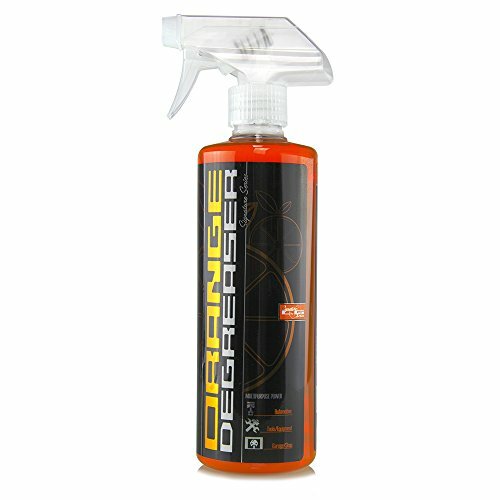 The Chemical Guys CLD 201 16 Signature Series Orange Degreaser has a unique citrus formula that gives off a pleasant aroma and yet still works quickly and effectively. This formula starts eliminating filth immediately upon application, so you do not have to kill time waiting to drive your car again. This super concentrated formula can make a little go a long way or be used to tackle hard to remove buildup. The Chemical Guys Orange degreaser is a versatile formula that can be used on wide variety of objects. You can clean grease and grime off of all sorts of things, not just your engine. However, what it has in versatility, it somewhat lacks in effectiveness. To tackle more intense grease and gunk spots, you will need to use a lot of degreaser, making it probably not the most efficient option. The WD-40 300076 Specialist Foaming Machine and Engine Degreaser is another inexpensive option that gets the job done right. 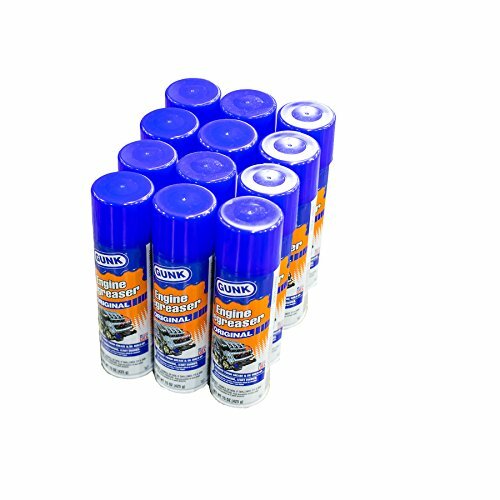 This foaming formula is specifically designed to seep into small cracks and crevices to reach those hard to get to spots and truly wipe grease clear off every part of the engine. The spray nozzle can reach long distances and cover a lot of surface area. There is also a long straw attachment for the nozzle for more accurate and precise application so you can directly hear those annoying hard to reach grease buildups. The WD-40 is an effective degreaser that is perfect for tackling most grease stains. However, when faced with larger buildups or older, more worn in stains, this engine degreaser sometimes fails to live up to expectations and has trouble getting the job done in one go. All in all, with a low price and far reaching foaming formula, this engine degreaser is a great fit for just about any vehicle. 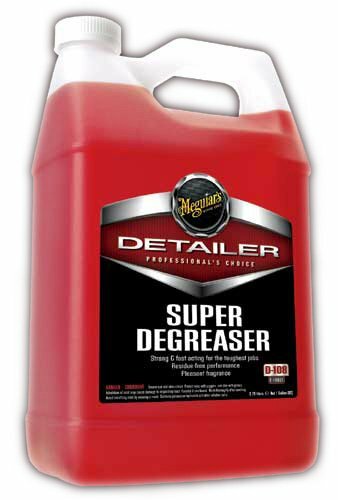 The Meguiar’s D10801 Super Degreaser is a more expensive option compared to a lot of other degreasers on the market. However, this engine degreaser does such an excellent job tackling those hard to eliminate spots that you can pretty easily justify the expensive cost. It works effectively and quickly, eliminating almost all grease right away after just one use. There have been reports from verified buyers about packaging issues, dealing with leaks and cracks. However, this engine degreaser does a great job removing all filth without leaving behind an unpleasant residue. And on top of all that, it has a delightful herbal scent. 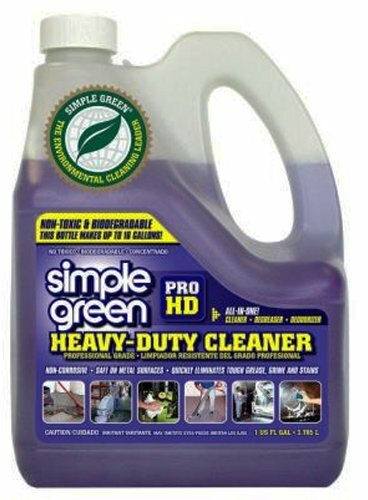 The Simple Green 13421 Pro HD Heavy Duty Cleaner is the best engine degreaser choice if you are looking solely at environmental impact. The formula is non-toxic, does not corrode anything, and is very eco-friendly. That also explains why it is just as useful in kitchen cleaning as it is at cleaning engines. The Simple Green does not just remove grease and grime buildup, but also helps get rid of unsightly stains. However, when it comes to more heavy duty messes, it is not as effective at tackling those bigger clean up jobs. But if you are primarily interested in a safe yet still effective engine degreaser that will not cause serious damage to our planet, then the Simple Green engine degreaser is an excellent choice for you. 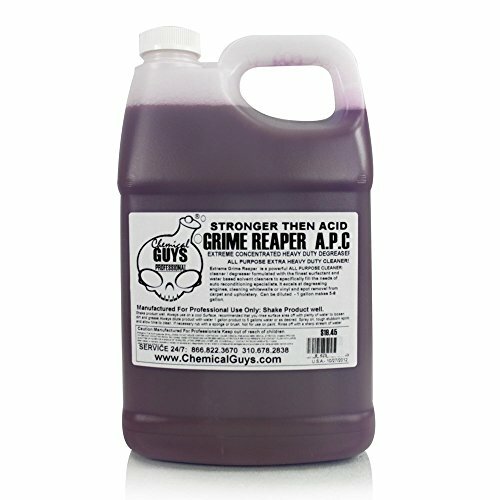 The Chemical Guys CLD 104 Grime Reaper Extremely Strong Detergent is a super concentrated formula. Ideally, that would mean it is extra effective and you can dilute it with water to make it last a long time. But instead of a little bit going a long way, this engine degreaser actually is less effective than many other options. You actually need more of this degreaser than you typically do of other formulas. However, the Chemical Guys Grime Reaper engine degreaser is still a useful option for cleaning your engine. It leaves behind no gross, unpleasant residue that you have to deal with. And on top of that, it goes to work fast, tackling grease right away and doing its job efficiently. A good engine is a grease free engine. Grease and grime buildup can seriously limit your engine’s performance and even shorten the life of your vehicle. That is why you should always take the time and effort to clean your engine of grease to keep it running in tip top shape. When deciding which engine degreaser to use, consult this guide and rest assured you made the right decision for your car.